Husse is the world's fastest growing pet food franchise and the only one with international success. The pet food industry has been categorised by Forbes and other publications as 'recession proof' and is attracting a host of entrepreneurs and investors to join this thriving £3 billion industry in the UK. Husse is listed in the Top 100 Global Franchises and is currently the only pet food company to make it onto this list – making us the number 1 pet food franchise in the world! The Husse brand has expanded rapidly since launching in the UK. Currently we have over 80 trained nutritionists representing Husse across 50 regions. Husse is the fastest growing pet food franchise in the UK and the only one with international success. Husse operates in over 54 countries, its factory is ISO 9001 regulated, and is believed to be the first European pet food company to be granted a DA licence to import into the United States. With a 95% customer retention rate - our money-back taste guarantee demonstrates our confidence in the quality of our products and is covered by Husse UK's head office. Husse (pronounced “hoo-say”) is a global brand established in 1987. Husse produces and sells a wide range of affordable premium pet food, accessories, health and hygiene products for cats and dogs, and care supplements for horses. 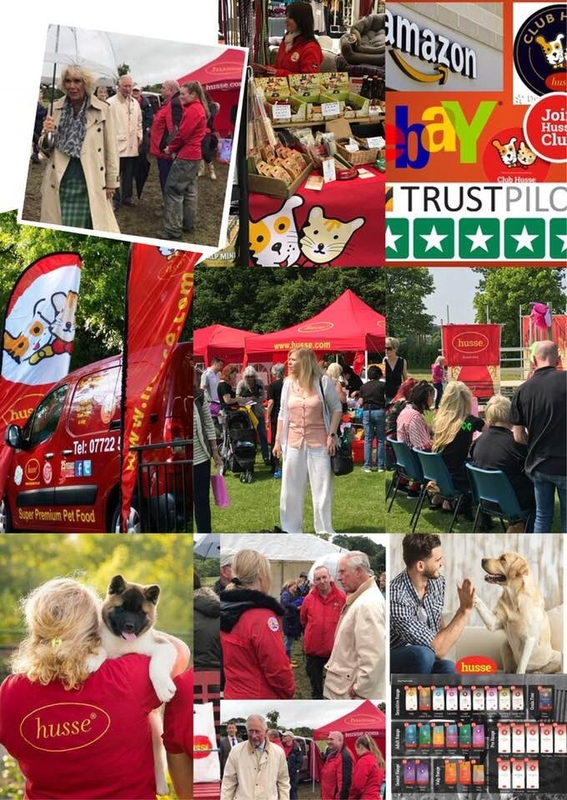 With over 1100 franchisees worldwide our Husse franchisees and pet food nutritionists regularly deliver our super premium products to several hundred thousand loyal customers at no extra cost directly to the customer’s door. Pet food is in year-round demand and our franchisees benefit from high profit margins across our 350-product range. Our products are produced from independently verified human grade natural ingredients. Our 100% sincere label policy provides our customers with complete confidence and reassurance. Unique Scandinavian recipe – pets love the taste of our unique Scandinavian recipe. Unlike other local products, which all possess similar ingredients and a similar taste to each other, Husse offers something different to the rest! 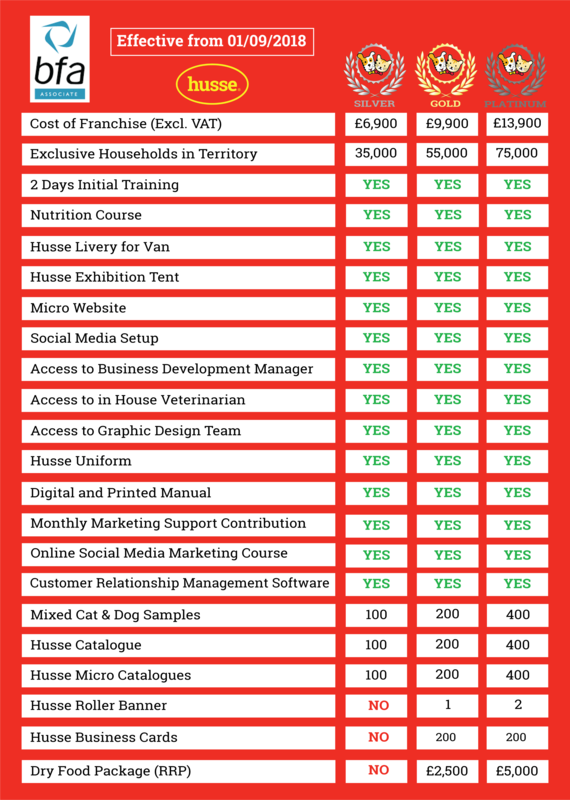 Various revenue streams – Husse's unique professional range offers an additional revenue stream by targeting pet related businesses, such as breeders, kennels, catteries, groomers, trainers, etc. Competitive pricing – high quality ingredients and high digestibility makes Husse a more economical choice for pet owners. Our initial training program covers product knowledge, pet nutrition (centre of excellence canine nutritional qualification), sales, marketing and user training for our bespoke CRM and order tracking system. Our ongoing support gives you access to our off-line and online educational materials which are hosted on a cloud-based system and are regularly updated. You will also receive unlimited access to our in-house graphic designer, who will help you with all your artwork and design requirements. Our in-house vet will also always be at hand to help answer any questions you or your customers may have. Husse arranges regular meetings, seminars and webinars offering continuous development opportunities to its franchisees. Pleas fill out the enquiry form below! Get more info about our packages! Send us your questions & info. -- Please select-- Mr. Ms. Mrs. Dr.